Located in Waterville, Maine, 90 minutes north of Portland, 60 minutes south of Bangor, and 3.5 hours north of Boston. Our residential campus is made up of 120 acres. President Laurie Lachance is the College’s fifth president, first female president and a graduate of Thomas’s MBA program. The average size class has 18 students. Thomas offers a variety of areas of study for undergraduate and graduate students, all focused on quality job placement and lifelong success. Students participate in internships and study abroad in all majors. Financial aid is made up of a combination of merit-based scholarships, need-based aid, loans, and scholarships from outside groups, including private foundations and veteran’s programs. In 2013, Thomas College awarded $7 million in institutional aid to students. 96% of students that apply for financial assistance receive an award. 55.3% of Thomas students are eligible for Federal Pell Grants. Thomas guarantees tuition will not increase for students who maintain a 3.8 grade point average each academic year. 94% of Thomas graduates have a job within 90 days of graduation. Thomas guarantees job placement for students who maintain a 3.0-grade point average, participate in an internship, and work with career services. 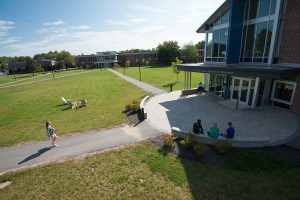 Thomas College admits students on a rolling basis and encourages applicants to submit their materials in the fall or winter; the priority deadline for admission is March 15. Admission decisions take up to three weeks once all required materials are submitted.Early Action admission is available for students who apply by December 15. This “non-binding” admission decision allows students to be notified of our admission decision early, but does not require a commitment to attend Thomas until May 1. Students who visit campus will receive a fee waiver for our application fee. Retention: 63% of entering students continue with Thomas College in their second year. Graduation: 48% of entering students earn their degrees at Thomas College. 66% of students live on campus.Thomas College students have on-campus housing options including community living, hotel-style housing, suite-style housing, or townhouses. There are over 40 campus activities and clubs and a wide variety of options for recreation and intramural sports. The Thomas College Terriers are an NCAA Division III school in the North Atlantic Conference with schools all over New England. Thomas offers men’s baseball, basketball, cross country, golf, lacrosse, soccer, and tennis, and women’s basketball, cross country, field hockey, lacrosse, soccer, softball, and tennis. We also have club teams for ice hockey, and track & field.